Easily accessible itineraries can be reached in just a few minutes using the Grand Massif lift system. Our Walking Guides will give you a few ideas for walks, from family strolls to strenuous hikes. 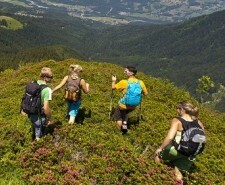 Discover our themed trails which will lead you across the Grand Massif alpine pastures and the Platé Desert. Just cause you running on the trails of the Grand Massif. Elevation, varied terrain, landscapes, the Grand Massif offers a multitude of possibilities!